Waukesha Model 64 positive displacement lobe pump with 15 inch long by 13 inch wide by 7 inch deep stainless steel hopper feeding the pump's 2.5 inch by 8.5 inch rectangular to infeed opening. Dual lobes / dual impellers, with 2 inch bottom Tri-clamp discharge. The pump itself is USDA sanitary with all stainless steel product contacts (the removable hopper is not USDA sanitary). Mounted with a 5 horsepower SEW Eurodrive variable speed drive on a common stainless steel base on casters; set for a 27 inch infeed height to hopper (20 inches to pump flange), and 10 inch discharge height. On-off switch, 208/230/460 volt electrical input. As of this writing, this hopper fed lobe pump is in stock at Alard, in good condition, available for timely shipment. Willmes model WHA-1250 horizontal automatic press, manufacturer rated for 44 cubic foot / 1250 liter capacity, approximately 3.3 ton fresh grape capacity, with a pressing cycle of approximately 1 hour to 1 hour 15 minutes depending on fruit being pressed and dryness of pomace desired. 36 inch diameter by 68 inch long stainless steel perforated press drum over a 40 inch wide by 80 inch long bottom catch pan, with 2 inch end bottom outlet.Fruits fed via top center infeed point to into the drum, which rotates 180 degrees to discharge. The grapes are squeezed by an auger-driven pressure plate that presses in horizontally. As of this writing, this Willmes wine press is in stock at Alard, in good condition, available for immediate shipment. Manufacturer rated for 130 lb capacity with a 7.36 cubic foot removable basket which measures 30 inches in diameter by 18 inches deep. All stainless steel product contact surfaces, stainless steel base with metallic paint coated steel support legs. Includes remote / wall mount PVC electrical control panel with a 10 minute timer, and operator speed control switch for three speed settings 800, 1000, or 1200 RPM. NEW variable frequency drive controller for the 5HP 3 phase drive motor, provides soft start, with electronic "reverse thrust" for basket braking, via a new braking resistor in the panel. The control panel includes a safety interlock circuit to lock the lid during operation. Has an automatic opening lid, which requires 80-100 psi air supply. 208/230 volt 3 phase elecrical input required. As of this writing, this refurbished super salad spinner is in stock at Alard, completely reconditioned to EXCELLENT mechanical, electrical and cosmetic condition, ready for immediate shipment. Accepts products up to 2.5 inches (63.5mm) in diameter or width. 30 degree ANGLED cutting head. Manufacturer recommended for pickles, carrots, celery, plantains, rhubarb, okra, potatoes, zucchi, squash, bread, and a variety of other vegetable and fruit products, on slices from 1/16 inch to 1.75 inch. The manufacturer also offers a special micro-slice cutting head for .30 to .120 inch slices. CALL 315-589-4511 to discuss configuring this machine for YOUR cutting requirements. 52" long by 2.5 inch usable width food grade white rubberized feed belt, 36 inch infeed height, 27 inch discharge height. All stainless steel product contact surfaces, guards and shrouds. Painted tubular steel frame. (We can fabricate a stainless steel frame at extra charge). Powered by two 230/460 volt 3 phase drive motors (one for the belt, one for the cutting head). 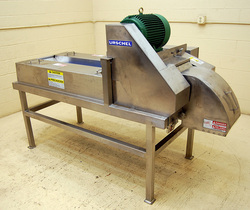 As of this writing, this refurbished Urschel slicer is in stock at Alard, in EXCELLENT operational, mechanical, cosmetic and electrical condition, needing only to be fitted with the cutting head of your choice to be ready to go and available for immediate shipment. 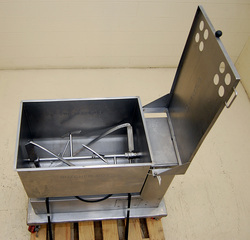 31" long by 20" wide by 24" deep horizontal U-shaped stainless steel mixing vessel. (4) paddles on a 1" diameter stainless steel shaft, with counter-rotating sigma ribbon 1 inch wide by 5/16 inch thick, with end sweeps on each end. Tilt to dump with multiple postion latch, hinged stainless steel cover with viewing ports, on casters for portability. Food-grade USDA sanitary product contacts, all stainless steel construction. Complete with 2HP 230 volt 3 phase drive. 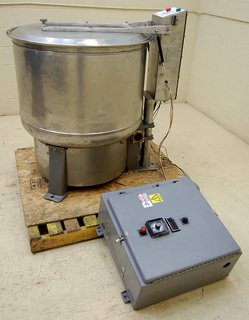 As of this writing, this refurbished Butcher Boy double motion paddle blender is in stock at Alard, EXCELLENT operational, mechanical, electrical, and cosmetic condition, available for immediate shipment. Consists of a stainless steel ferris wheel type reel in a stainless steel tank, on a tubular stainless steel frame. 72 inch diameter by 48 inch wide reel, with 14 inch high flights on 16 inch centers. Each of the flights have 3/16 inch diameter perforations. The bottom tank is shaped to fit the reel, and has various pipe inlets for maintaining liquid levels, as well as a site glass level indicator. Presently set for an 81" infeed height and a 64" discharge height but could be lowered by approximately 40" with minimal labor. All food grade stainless steel construction. 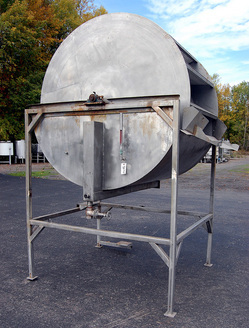 As of this writing, this preservative or caustic fluid dip tank / washer tank / vegetable rinser is in stock at Alard, in good condition, available as-is, or can be completed in our shop prior to shipment with motor, belt, chain, guards and overall cleanup to complete. Manufacturer rated for cutting products up to 1/2" (13mm) thick, such as spinach, greens, peppers, citrus peel, celery, broccoli, parsley. Manufacturer literature specifies this model for cutting square or rectangular dices, with circular knives that can be spaced for cuts from 3/16" to 3", and a selection of crosscut spindles available for cuts from 1/4" to 3" (76mm). Strip cuts can be made by removing the crosscut knife spindle from the machine, with the length and thickness of the strips depending on the size of the original product. Food grade stainless steel and Urschalloy product contact surfaces, stainless steel tubular support frame, guards, shrouds and discharge chute. Presently set for 1/2" dices, other cut sizes are available (please CALL us at 315-589-4511 to discuss your cutting specification) to fit your needs. Complete with 5HP 3 phase drive motor controlled by a factory control panel with safety interlock system. 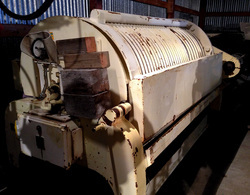 As of this writing, this reconditioned Urschel J dicer / strip cutter / greens chopper is in stock at Alard, in EXCELLENT operational, mechanical, electrical and cosmetic condition, needing only to be fitted with cutting spindles to buyer specification (please tell us your cutting requirements) prior to shipment. Loma SuperScan Micro digital METAL DETECTOR with all stainless steel search head enclosure with digital operator controls, on a stainless steel through-conveyor with a 16 inch wide by 84 inch long plastic interlocking chain type conveyor belt, riding on an anti-static UHMW plastic bed. The detection head and conveyor drive are integrated with a belt-stop-alarm reject configuration, with stainless steel power supply and junction boxes. Sanitary food grade stainless steel washdown construction, previously used for food process metal detection in a USDA inspected plant. 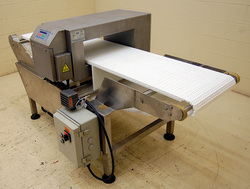 As of this writing, this refurbished food process metal detector with conveyor is in stock at Alard, in EXCELLENT operational, electrical, and mechanical condition, ready to go and available for immediate shipment.